Please read these terms and conditions of use carefully before you start to use our Site. In order to use our Site as a member or a visitor you affirm that: (i) you are able to understand, accept and abide by these Legal Terms and Conditions; (ii) all registration information you provide will be accurate and truthful and you agree to update this information in a timely fashion; (iii) you are at least 18 years of age or older. If you are not at least 18 years of age, unfortunately, you cannot use our Site. By enrolling as a Member, or by utilizing any of our rebate program applications ("Applications"), you agree to be bound by this Agreement. Enrollment as a Member is simple: you must provide an email address so we can inform you when money or other rewards are credited to your account. Earning back a portion of your purchases as cash back ("Cash Back") is straightforward. Choose a store, product, coupon or other offer displayed on our Site, click the accompanying shopping link to be directed to an affiliated store's website ("Affiliated Merchant"), and complete a purchase to earn Cash Back on your net purchase amount. Qualifying Purchases: Specific Cash Back amounts vary by store, product category, and cash back exceptions and are provided in detail at the Store Detail Page on the Site. We encourage users to review the cash back terms and exceptions before clicking on the "Shop Now" button. Please note that the net purchase amount excludes taxes, fees, shipping, gift-wrapping, discounts or credits, returns or cancellations, and extended warranties. Certain Affiliated Merchants exclude a limited number of products and purchases from the Program. We do our best to minimize and maintain an up-to-date list of exclusions on our Site. Additionally, to earn Cash Back, you must complete your purchase during the same shopping session you start after clicking on the appropriate link. If you visit other sites before completing your purchase or use coupons not provided by the Site, your purchase might be associated with a service other than one on the Site and you might not earn cash back on your purchase. If you disable 'cookies' on your computer you will not be able to earn Cash Back as cookies are used to authenticate the user and be certain Cash Back is assigned to the Member account. To receive payment of accrued Cash Back and any other rewards, you must establish and maintain an active account with us ("Active Account") with the information necessary to process your payment: a valid email address at which you can receive email, a valid postal address at which you can receive mail, your first and last name, and a password to protect your account. To maintain your Active Account, you must update your information if it changes and has shopped via our Site or have accrued Cash Back at any time within the last twelve (12) months. The Company pays its members accrued Cash Back and other rewards every three months, at minimum amounts of $5.00 or more. The Company pays members in U.S. dollars via check, Paypal, and sometimes other payment options. Members may select or change their payment options. Each payment represents cashback, and other rewards earned and accrued during the prior quarter based on the schedule below. Please note that orders from a few Affiliated Merchants may be delayed by one pay cycle due to delayed processing and reporting by the stores. We do our best to expedite payments and to maintain a list of stores whose practices might delay our ability to pay Cash Back on your purchase. The Company reserves the right to delay payment for any purchase based on changes to Affiliated Merchant policies and procedures at any time. You must be logged into the Site and enter your password to change your account information and payment preferences. You may check your account status and recent earning history at any time on the Site. By signing up for membership on the Site, you agree to receive communications that are account and membership related (e.g., that we've added money to your account, that we are mailing you a check on a certain date, etc.) as well as periodic shopping-related emails that highlight coupons & special deals that are available to Members. You can opt-out of receiving emails that are not account-related by either (i) visiting your account page, or (ii) following the unsubscribe link on any of the emails. Since we need to communicate account information with you to operate our service, you cannot unsubscribe from account information emails. But rest assured that we don't send account emails unnecessarily. If you do not wish ever to hear from the Company, even if just to hear that we awarded you Cash Back, you can close your account by contacting the Company’s customer service department. The Company does not provide tax, legal or accounting advice. This material and the contents of this Site have been prepared for informational purposes only, and are not intended to provide, and should not be relied on for, tax, legal or accounting advice. The Company disclaims any liability arising out of your use of, or any tax position taken in reliance on, such information. Always consult independent tax, legal and accounting advisors before engaging in any transaction. Rules and regulations regarding tax deductions for charitable giving vary at the state level, and laws of a specific state or laws relevant to a particular situation may affect the applicability, accuracy, or completeness of the information provided. The Company cannot guarantee that such information is accurate, complete, or timely. All information in this Site is provided "as is", with no guarantee of completeness, accuracy, timeliness or of the results obtained from the use of this information, and without warranty of any kind, express or implied, including, but not limited to warranties of performance, merchantability and fitness for a particular purpose. Our Site utilizes an external payment processor to validate and process disbursements and payments to charities that you select. The payment processor automatically confirms the charity’s tax-exempt status by verifying its good standing with public and government sources, including the IRS. You understand that payment processor is independent of the Company and that the Company has no control over the operation or content of payment processor. Company shall not be responsible and have absolutely no liability for any matters arising out of Customer’s use of payment processor and its services. The Company has absolutely no involvement in your selection or allocation of funds, if any, to a charity. You are required to make fully informed decisions about selecting charities and the allocation of funds to charities. The Company has a number of affiliate links from this site as mentioned on our pages throughout “This site contains affiliate links for which we earn a small commission if you shop through them. This is how we help to make money so we can continue to bring you amazing deals and content!” If you shop our website, when purchasing a particular product you will be redirected to a merchant's site to complete the transaction. This transaction, or avenue thereof, is known as an affiliate link of which we have several. The Company makes every effort to ensure that all information on our site is complete, and accurate per all guidelines set forth by the FTC. Prices, offers, and Cash Back are subject to change. Restrictions may apply. Some products may appear smaller or larger than their actual size in the pictures on the Site. Also, every computer monitor is set differently, therefore colors and sizes may slightly vary, based on the computer type you are using. • not in violation of this Agreement. The Company does not install or require you to install any software to access the Cash Back Shopping Program. Members can earn Cash Back on their purchases by using only the Web site Kiindly.com. 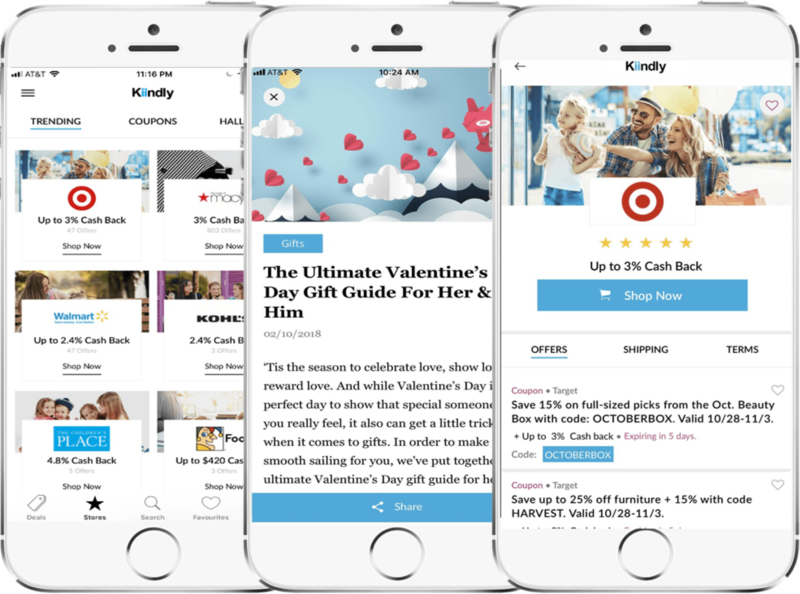 The Company plans to make available a limited number of Applications to assist users in earning Cash Back without visiting Kiindly.com (for example, from mobile devices or in-store). If you use the Company’s Applications, you agree to use them only for your personal use and for accessing the Program. The Company reserves the right to update or discontinue its Applications at any time. You agree not to reverse engineer, decompile, disassemble, copy or otherwise derive the source code of Company Applications for any reason. You may not rent, sell, or sublicense the Company’s Applications without the Company’s prior written consent. Company Applications and their underlying information and technology may not be exported or re-exported into any country to which the U.S. has embargoed goods or to anyone on the U.S. Treasury Department's list of Specially Designated Nationals or the U.S. Commerce Department's Table of Deny Orders. By using Company’s Applications, you represent and warrant that you are not located in, under the control of, or a national or resident of any such country or on any such list, and that you will otherwise comply with all applicable export control laws. All rights to Company’s Applications are reserved by Company under the copyright laws of the United States. Membership in the Company program is free: there is no charge to be a Member or to earn and receive Cash Back. If the balance in your inactive account is or becomes zero after 24 months of no activity, Company will close the account permanently and cease to maintain your account records and Program access. The inactive account maintenance charge will not cause your account balance to become negative and will not cause you to owe money to Company. It is your responsibility to check your account regularly to ensure that Cash Back has been properly credited and paid and that your account balance is accurate. If you do not believe that Cash Back has been correctly credited to your account, you must contact Company Customer Service within 90 days of the transaction. Should you disagree with any adjustments made to your account or payments made to you, your sole remedy is to withdraw from the Program. You may be taxed on your receipt of cash and other consideration (merchandise, travel, etc.) for member referrals, depending on the tax laws of federal, state, and local jurisdictions. Company may choose to provide you with those notices to you on occasion. In all instances, you will be solely responsible for any and all tax liability arising out of the consideration received for member referrals. Company is not responsible for changes to, or discontinuance of, any Affiliated Merchant, or for any Affiliated Merchant withdrawal from the Program, or for any effect on accrual of Cash Back caused by such changes, discontinuance, or withdrawal. Company is not responsible for changes to, or discontinuance of, any special offer or coupon code at an Affiliated Merchant site. We reserve the right to withdraw, amend, suspend or terminate indefinitely the service we provide on our Site without notice. We will not be liable if for any reason our Site is unavailable at any time or for any period. You are responsible for making all arrangements necessary for you to have access to our Site. You are also responsible for ensuring that all persons who access our Site through your Internet connection are aware of these terms and that they comply with them. Users with suspended or terminated accounts are prohibited from creating new accounts with us. When you join as a member on Kiindly.com, you authorize us to collect information about your on-line activity which may include the items or services that you purchased to track cashback, evaluate, develop, offers and promote our affiliates’ and our Sponsors’ products and services to you. You agree that you will be personally responsible for your use of the Service, and you agree to defend, indemnify and hold harmless MYSMARTGIVING INC/Kiindly.com and its officers, directors, employees, consultants, affiliates, subsidiaries and agents from and against any and all claims, liabilities, damages, losses and expenses, including reasonable attorneys' and accounting fees and costs, arising out of or in any way connected with (i) your access to, use of or alleged use of the Service; (ii) your violation of the Terms or any representation, warranty, or agreements referenced herein, or any applicable law or regulation; (iii) your violation of any third party right, including without limitation any intellectual property right, publicity, confidentiality, property or privacy right; or (iv) any disputes or issues between you and any third party. We reserve the right, at our own expense, to assume the exclusive defense and control of any matter otherwise subject to indemnification by you, and in such case, you agree to cooperate with our defense of such claim. All intellectual property and database rights, in our Site, and in the materials published on it, including but not limited to trademarks, designs, logos, text, images, audio and video materials, look and feel and software (including code, interface, and website structure) (“Materials”) are owned by us, our subsidiaries, affiliates companies and/or any of our partners (“the Owners”). The Materials are protected by intellectual property laws and treaties around the world. All such rights are reserved. You may not remove any copyright or other proprietary notices from any Materials on our Site. We reserve the right to copy protect any of the Materials on our Site. Except as provided in these terms and conditions, the use of this Site does not grant you any rights, title, interest or license to any Materials you may access on this Site. Unless otherwise specifically authorized by us (by way of example only, explicit instructions such as “Click Here to Enlarge this Image”) you must not modify the paper or digital copies of any Materials you have printed off or downloaded in any way, and you must not use any illustrations, photographs, video or audio sequences or any graphics separately from any accompanying text or proprietary notice. All copying (whether in electronic, hard copy or other format) reproduction, transmission, public performance, distribution, commercial exploitation, adaptation, translation, modification, bundling, merging, sharing or making available to any person, or creation of any derivative works of our Site or the Materials on our Site is prohibited and may breach intellectual property laws and other laws worldwide. The status of the relevant Owners (and that of any identified contributors) as the holders of rights in the Materials on our Site must always be acknowledged. • To send, knowingly receive, upload, download, use or re-use any of our Material which does not comply with our content standards below. • To transmit, or procure the sending of, any unsolicited or unauthorized advertising or promotional material or any other form of similar solicitation (spam). • To knowingly transmit any data, send or upload any material that contains viruses, Trojan horses, worms, time-bombs, keystroke loggers, spyware, adware or any other harmful programs or similar computer code designed to adversely affect the operation of any computer software or hardware (“Malicious Code”). We may from time to time provide interactive services on our Site including, without limitation, chat rooms, and forums, or bulletin boards. Where we do provide any interactive service, we will provide clear information to you about the kind of service offered, if it is moderated and what form of moderation is used (including whether it is human or technical). We will make reasonable efforts to assess any possible risks for users from third parties when they use any interactive service provided on our Site, and we will decide in each case whether it is appropriate to use moderation of the relevant service (including what kind of moderation to use) in the light of those risks. However, we are under no obligation to oversee, monitor or moderate any interactive service we provide on our Site, and we expressly exclude our liability for any loss or damage arising from the use of any interactive service by a user in contravention of our content standards, whether the service is moderated or not. Where we do moderate an interactive service, we will normally provide you with a means of contacting the moderator, should a concern or difficulty arise. You hereby grant to us the royalty-free, perpetual, irrevocable, worldwide, non-exclusive right and license to use, reproduce, modify, adapt, publish, translate, create derivative works from, distribute, perform, and display all content, remarks, suggestions, ideas, graphics, or other information communicated or uploaded to us by you through this site (together, the “Submission”), and to incorporate any Submission in other works in any form, media, or technology now known or later developed. We will not be required to treat any Submission as confidential, and may use any Submission in our business (including without limitation, for products or advertising) without incurring any liability for royalties or any other consideration of any kind, and will not incur any liability as a result of any similarities that may appear in our future operations. We also have the right to disclose your identity to any third party who is claiming that any Submission by you to our Site constitutes a violation of their intellectual property rights, or of their right to privacy. You waive any moral rights in respect of any Submission made by you through our Site. We will not be responsible, or liable to any third party, for the content or accuracy of any Submissions made by you or any other user of our Site. We have the right to remove any Submission you make on our Site if, in our sole opinion, such Submission does not comply with the content standards below. Any and all Submissions you contribute to our Site must comply with the spirit of the following content standards as well as the letter. The standards apply to each part of any Submission as well as to its whole. • Comply with applicable law in the US and in any country from which they are posted. • Contain sexually explicit material. • Harm, or attempt to harm, minors in any way. • Infringe any copyright, database right, trademark or other proprietary rights of any other person. • Promote any illegal or immoral activity. • Be threatening, abusive or invade another’s privacy, or cause annoyance, inconvenience or needless anxiety. • Give the impression that they emanate from us if this is not the case. This list serves to provide examples and is not meant to be an exhaustive list of the types of unacceptable uses that may result in the restriction, suspension or termination of your use of our Site. Submissions (including commentary and other materials) posted on our Site are not intended to amount to advice on which reliance should be placed. We, therefore, disclaim all liability and responsibility arising from any reliance placed on such Submissions by any visitor to our Site, or by anyone who may be informed of any of its contents. We aim to update our site regularly and may change the content at any time. Any of the material on our Site may be out of date at any given time, and we are under no obligation to update such material. Any Member who is suspended from the Site, or terminates their Member's account, may have their payments held for a minimum of 90 days to allow for settlement of outstanding contested fees or orders. Once 90 days have passed from the date of the account's suspension or termination, the Member should contact us to request account reconciliation. This is not, however, a guarantee of payment. Payments may be held for a longer period in cases of fraud or other improper/illegal activity. • IN NO EVENT WILL WE BE LIABLE FOR ANY INDIRECT, CONSEQUENTIAL, SPECIAL, INCIDENTAL, OR PUNITIVE DAMAGES ARISING OUT OF, BASED ON, OR RESULTING FROM THIS THESE LEGAL TERMS AND CONDITIONS OR ANY DOCUMENTS, ANY SITE DATA AND OTHER DATA OR INFORMATION, ANY SOFTWARE OR ANY OF THE SERVICES PROVIDED THROUGH YOUR INTERACTION WITH THE SITE, AND/OR PROVIDED HEREUNDER, AS WELL AS ANY INFORMATION AND DOCUMENTS, ANY DATA OR MESSAGES GENERATED, RECEIVED, TRANSMITTED, DOWNLOADED OR OTHERWISE DISSEMINATED WHICH ARE RELATED TO OR STEM FROM CUSTOMER’S USE OF OR REGISTRATION AT THE SITE, INCLUDING DAMAGES FOR LOST PROFITS, LOST REVENUES, OR BUSINESS INTERRUPTION. NOTWITHSTANDING ANY OTHER PROVISION CONTAINED IN THIS THESE LEGAL TERMS AND CONDITIONS, THE AGGREGATE CUMULATIVE LIABILITY OF THE COMPANY, AS WELL AS THIRD PARTY SERVICE PROVIDERS, IN ANY AND ALL CIRCUMSTANCES, TO YOU FOR ANY AND ALL CLAIMS ARISING OUT OF OR IN CONNECTION WITH THIS THESE LEGAL TERMS AND CONDITIONS, ITS TERMINATION, OR ANY SERVICES, WILL NOT EXCEED $500.00. FURTHER, CUSTOMER UNDERSTANDS THE COMPANY IS NOT AN AGENT OF AND ASSUMES NO RESPONSIBILITY FOR THE ACTS OR OMISSIONS OF ANY THIRD PARTY SERVICE PROVIDERS NOR ANY ASPECT OF THE SERVICES RELATED TO THOSE THIRD PARTY SERVICE PROVIDERS. THIS SECTION APPLIES: (a) EVEN IF THE COMPANY HAS BEEN NOTIFIED OF THE POSSIBILITY OF SUCH DAMAGES AND EVEN IF THE REMEDIES OTHERWISE PROVIDED UNDER THIS THESE LEGAL TERMS AND CONDITIONS, AT LAW, OR IN EQUITY FAIL OF THEIR ESSENTIAL PURPOSE; AND (b) REGARDLESS OF THE FORM OR CAUSE OF ACTION OR THE ALLEGED BASIS OF THE CLAIM, WHETHER BREACH OF CONTRACT, BREACH OF WARRANTY, NEGLIGENCE OR OTHER TORT, TRADE USAGE OR ANY OTHER CAUSE OF ACTION OR BASIS, TO THE EXTENT SUCH EXCLUSION AND LIMITATIONS ARE NOT PROHIBITED BY APPLICABLE LAW. You must not misuse our Site by knowingly introducing any Malicious Code. You must not attempt to gain unauthorized access to our Site, the server on which our Site is stored or any server, computer or database connected to our Site. You must not attack our Site via a denial-of-service attack or a distributed denial-of service attack. We will report any such activity by you to the relevant law enforcement authorities, and we will co-operate with those authorities by disclosing your identity to them. In the event of such a breach, your right to use our Site will cease immediately. You must not establish a link from any website to any page in our Site or frame our Site on any other site. Unless otherwise authorized in writing by us, you may not suggest any form of association, approval or endorsement of any website on our part. Further, you may not co-brand this site without our express prior written permission. For purposes of the preceding sentence, “co-branding” means to display a name, logo, trademark, or other means of attribution or identification of any party in such a manner as is reasonably likely to give a user the impression that such other party has the right to display, publish, or distribute this site or content accessible within this site. You agree to cooperate with us in causing any unauthorized co-branding or framing immediately to cease. In addition, you may not use our Site in any manner which could disable, overburden, damage, or impair the Site or interfere with any other party's use and enjoyment of the Site. You may not obtain or attempt to obtain any materials, content, or information through any means not intentionally made available or provided for through the Site. Other prohibited uses include the use of robots, spiders, or any automatic device, or use of any manual process to copy or scrape the web site content for any purpose without our express written permission. Notwithstanding the foregoing, we grant the operators of public search engines permission to use spiders to copy materials from the Site for the sole purpose of and solely to the extent necessary for creating publicly available searchable indices of the materials, but not caches or archives of such materials. The website or applications which you use may automatically download and install updates from time to time. These updates are designed to improve, enhance and further develop the Site and may take the form of bug fixes, enhanced functions, new software modules and completely new versions. You agree to receive such updates (and permit the Company to deliver these to you) as part of your use of the Site. Some of the Site may be supported by advertising revenue and may display advertisements and promotions. The manner, mode and extent of advertising on the Site are subject to change without specific notice to you. In consideration for us granting you access to and use of the services, you agree that we may place such advertising on the Site. We make no warranties or representations whatsoever regarding any other websites that Customer may access or enroll in through the Site. When accessing or enrolling in a non-Company Site, Customer understands that the website is independent from Company and that the Company has no control over the content of that website. In addition, a link to a non-Company website does not mean that the Company endorses or accepts any responsibility for the content or the use of such website. It is up to Customer to take precautions to ensure that whatever is selected for Customer’s use is free of viruses and other items of destructive nature. Any link on the Site to third party websites is being provided by us to you as solely a convenience. The Company makes no warranty or representation regarding the linked sites themselves or the contents thereon, and the Company is not in any way responsible for such information or content or for the privacy or security practices of such third party sites. The Company does not endorse or sponsor any linked Websites, the information appearing thereon, or any of the products or services described thereon. If you believe in good faith that a notice of copyright infringement has been wrongly filed against you, you may send the Company a counter-notice. All notices with respect to the Company should be sent to the Company Copyright Agent. The Company suggests that you consult your legal advisor before filing a notice or counter-notice. You expressly acknowledge and agree that the Company shall not be liable to you under any circumstances for declining to replace material. Also, be aware that there can be penalties for false claims under the DMCA. You agree that the Services provided by the Company shall be deemed solely provided and based in the State of New Jersey, USA, and that the Services shall be deemed a passive online site that does not give rise to personal jurisdiction over the Company, either specific or general, in jurisdictions other than the State of New Jersey. Any dispute that arises between you and the Company shall be governed by the laws of the State of New Jersey, USA, without regard to conflict of law provisions, and you agree to exclusive personal jurisdiction and venue in the state and federal courts of the United States located in Essex County, New Jersey. These Legal Terms and Conditions, and any rights and licenses granted hereunder may not be transferred or assigned by you but may be assigned by the Company without restriction. Should any provision of these Legal Terms and Conditions be invalidated by any court of competent jurisdiction, the invalidity of such provision shall not affect the validity of the remaining provisions of these Legal Terms and Conditions, which shall remain in full force and effect. No presumptions shall be made against the drafter of this agreement. The Company shall not be liable for delays or failures in its performance to the extent such failures or delays result from acts beyond the Company’s reasonable control, including, but not limited to, fire, flood, earthquake, elements of nature or acts of God, acts of war, terrorism, strikes, walkouts, riots, civil disorders, rebellions, quarantines, epidemics, embargoes or other similar governmental action. These Legal Terms and Conditions, together with the Privacy Notice on the Site and any other legal notices published by the Company on the Services, shall constitute the entire agreement between you and the Company regarding the Services. No waiver of any term of this these Legal Terms and Conditions shall be deemed a further or continuing waiver of such term or any other term, and the Company's failure to assert any right or provision under these Legal Terms and Conditions shall not constitute a waiver of such right or provision. YOU AND THE COMPANY AGREE THAT ANY CAUSE OF ACTION ARISING OUT OF OR RELATED TO THE SERVICES MUST COMMENCE WITHIN ONE (1) YEAR AFTER THE CAUSE OF ACTION ACCRUES, OTHERWISE, SUCH CAUSE OF ACTION IS PERMANENTLY BARRED. If you have any concerns about material which appears on our Site, please contact us by e-mail at [email protected] or http://www.kiindly.com/contact-us. The Company intends to pre-release the Site to limited users prior to the Site’s official launch. As such, the Site may contain errors, bugs, incorrect data, or other problems not usually associated with commercially available websites or applications. YOU ACKNOWLEDGE THAT THE CONTENT OR USE OF THE SITE MAY BE UNPREDICTABLE AND AGREE IT IS YOUR SOLE RESPONSIBILITY TO ENSURE ADEQUATE BACKUP OF YOUR DATA AND SYSTEMS PRIOR TO USING THE PRE-RELEASE VERSION OF THE SITE. THE COMPANY SHALL HAVE AND YOU HEREBY RELEASE THE COMPANY FROM ANY AND ALL DAMAGES OR LIABILITY ASSOCIATED WITH YOUR USE OF THE PRE-RELEASE SITE.